Note: Solar wind detectors onboard NASA's ACE spacecraft are currently saturated by the ongoing radiation storm. That is the (ironic) reason why solar wind values listed above are so low. Click here for better numbers from SOHO. STORM IN PROGRESS: A severe geomagnetic storm is in progress on Oct. 30th. It began at approximately 1700 UT when a coronal mass ejection (CME) swept past Earth. The CME (movie) was hurled toward our planet yesterday by an X10-class explosion from giant sunspot 486. Sky watchers at all latitudes should be alert for auroras. 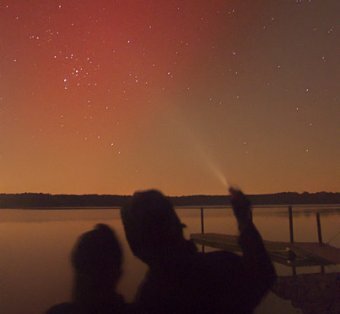 BRIGHT AURORAS: Oct. 29th was a great day for sky watchers. A CME hit Earth's magnetic field and triggered an extreme geomagnetic storm. In the United States, Northern Lights appeared as far south as Florida, New Mexico, Arizona and Texas. SUNSPOT 486: The source of all this solar activity is giant sunspot 486. This week it has unleashed two of the most powerful solar flares ever recorded and hurled massive CMEs toward Earth. More such eruptions are possible in the days ahead. Sunspot 486 is so big it's easy to see from Earth. But never look directly at the sun. Alway use safe solar observing techniques. Right: Amateur astronomer Don Parker of Coral Gables, Florida, best known for his remarkable photos of Mars, took this picture of sunspot 486 on Oct. 29th. The blue dot at the bottom is the size of the planet Earth. RADIATION STORM: Fast-moving protons, accelerated by the recent explosions on the sun, are streaming past Earth. This is what scientists call a proton storm. The ongoing storm rates an S3 on NOAA's space weather scale. Passengers and crew in commercial jets at high latitudes may receive low-level radiation exposure (approximately 1 chest x-ray). Click here to learn more about how proton storms affect Earth. A message from Spaceweather.com editor Tony Phillips: "The hard drive on my computer crashed this morning--an event unrelated to the ongoing solar activity. Many files were lost. Any readers who have sent me pictures in recent days--of auroras, sunspots (including paintings and drawings), the moon, California wildfires, etc.--please re-send them. Thanks!" You are visitor number 25907650 since January 2000.